Show the party people of the world you've got game with the right dress shoes on your feet when you're all decked out. The right dress shoes simply have to be Steven Land. Steven Land shoes feature hand made construction that only the finest leather dress shoes provide with comfort like leather lining and rich breathing calfskin leather uppers that are ready for you to take on the world or even the dance floor. 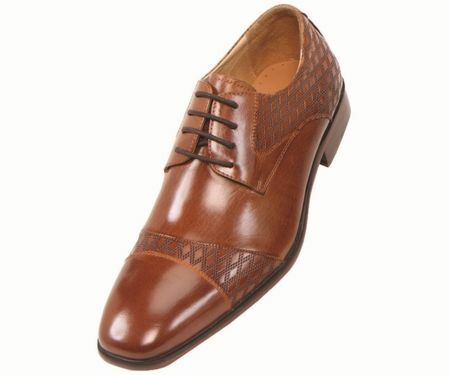 These rich tan color leather lace up shoes features a diamond style design in a smooth cap toe look ready to keep you in the fashion that Steven Land is famous for.